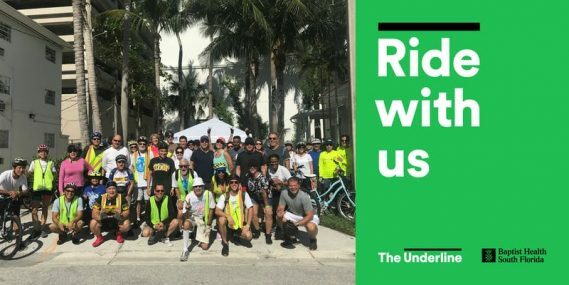 Hop on your bike and pedal your way to the Coconut Grove Arts Festival with The Underline Cycling Club and Bike Coconut Grove Sunday, February 17. Meet up at the Brickell Metrorail station and join for an adventure along the MPath as we ride to your favorite arts event! Stay and enjoy art and music or pedal back to the Brickell Metrorail Station. The Underline founder, Meg Daly will provide exciting updates on construction progress and art projects before we set off on our journey! Join for free, family-friendly bike rides along the MPath throughout the year with support of Baptist Health South Florida. Show your love with a donation of any amount at theunderline.org/donate.